How to Can Green Beans. Save a little bit of summer by canning your own green beans. Wash and rinse canning jars. Leave jars in hot water until ready to use. Wash beans. Discard damaged beans. Remove any strings from beans. Snap beans into 1 1/2 inch pieces. Place beans into large pan of boiling water. Drain beans. Catch water you drain and save for later step. Pack beans tightly in jar without smashing. Leave 1 inch of head space at top of jar. Add 1 tsp. salt per quart and 1/2 tsp. per pint of beans. Pour saved hot water over beans. Wipe top rim and threads of jar with clean, damp cloth. Place lid and screw ring on jar. Place jars of beans into pressure canner as recommended by manufacturer. Pressurize cans. Use 10 pounds of pressure for 20 minutes on pints and 25 minutes on quarts. Remove jars from canner and allow to cool about 12 hours. Check each jar for cracks, chips or nicks. Discard if necessary. Snap only enough beans for one can at a time for maximum freshness. Eliminate air bubbles in beans with a plastic knife when packing. Use a crayon to mark the date canned on top of warm lid. Check rubber seal on canner before you start the canning season. Replace if damaged. 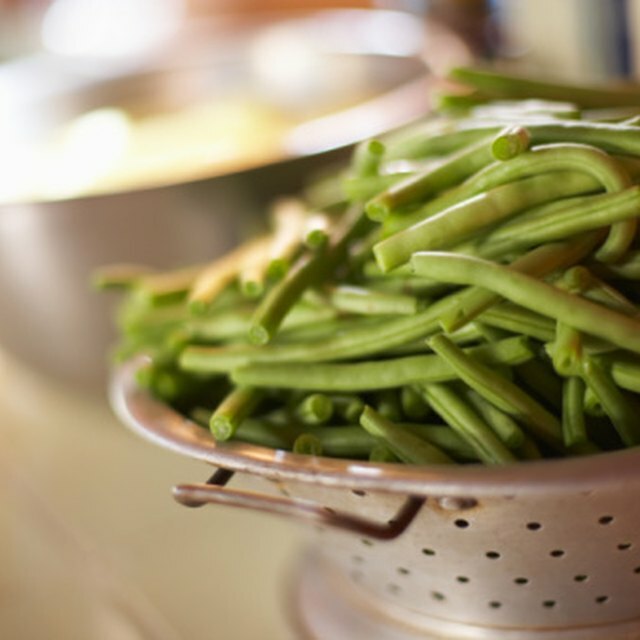 One bushel of green beans will make approximately 12-20 quart jars. Test seal by pressing center of lid. If the center is down the jar is sealed. If it moves when pressed, the jar did not seal. Discard beans in poorly sealed jars. Follow manufacturer instructions for using canner. Use only canning jars.